WE worked closely with PA consulting to develop 3 inspirational meeting and creative areas. The spaces were to be bright and imaginative with a collection of useful furniture and finishes. The "Attic" and the "Bunker" needed to have a different feel to the more traditional meeting spaces in the rest of the office. This was achieved using Buzzicubes, Buzzskin 3D tiles, and even Buzziland soundrafts in the Attic. This helped get some colour and texture into the space and then the practicality of the space was improved with the use of Flex folding tables (in some great colours), Tip Ton chairs, DoReMi screens with whiteboards and a Sketchalot presentation board for each room. 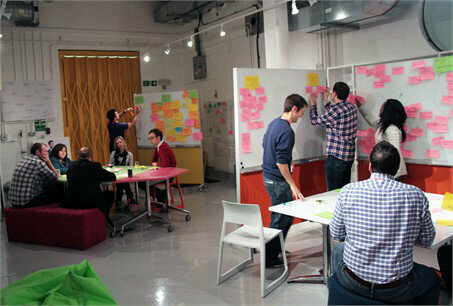 We also adjusted some folding cafe tables by giving them "whiteboard" table tops to help in brainstorming sessions. With some useful Voice storage system components giving some shelving and mobile storage and a large comfortable Chesterfield sofa and armchair with illumintated coffee table, the rooms were changed from having a fairly sterile atmosphere to something more inspirational. I'm sure these rooms will develop further as they are used but it was a great fun project to work on.